In the world where Fashion is not an option but a necessity, everybody is trying to figure out the style that defines them. From getting inspired by the greatest designers in the world to shopping at the local stall, we seek fashion from everywhere. And it has led the world to initiate different E-commerce webs that doesn’t only guide people towards the right choices in fashion but also introduce them to the latest and on-going trends and Today we are going to talk about one such social media platform that holds the ability to bring a change in the world of fashion with their unique and trendy ideas and is proved to be the one-stop destination for all your fashion related wonderings. Fashion Everyday, as the name suggests, it focuses on providing fashion related ideas for every day. Undoubtedly you will find numerous social media communities on the internet promising the same thing but what makes Fashion Everyday stand out of the crowd is the fact that it doesn’t focus on celebrity fashion. It aims towards being the source of the latest trends and ideas for the common population. The fashion that you could use in your everyday life. 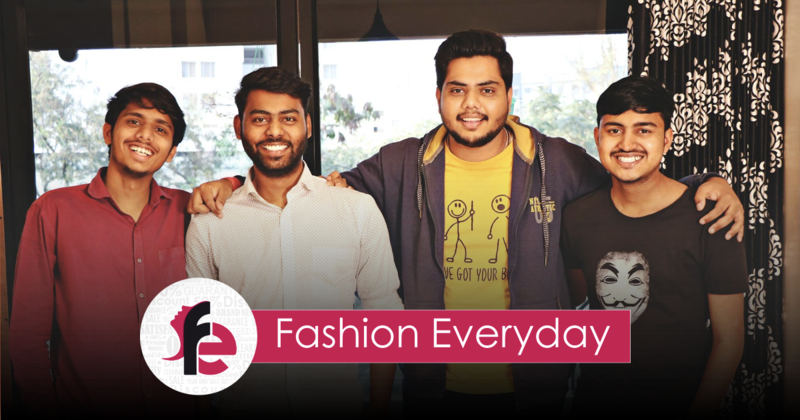 The brilliant minds behind this successful fashion based social media platform is Satyam Shastri (the chairman) and Nikhil Kale (the CEO) who is also known for running another leading community No One Cares. The very idea of fashion has always entertained us but what kind of fashion is suitable for you? What will define your style? And how will you keep yourself updated with the latest trends? Well, Nikhil and Satyam answer all your questions through their posts. Their team also includes Prashant Urankar and Mandar Kshire, another pair of youngsters they came across who were also trying their hands on the e-commerce world and now they all have united for creating something extraordinary. They say, the more the merrier and it has proved to be true in their case. The team of four holds unlimited potential, passion, and dedication to never let down its users. It is the result of their hard work that made Fashion Everyday reach +4 million hearts in no time. The community was started in the year 2016 and already secured its place in a million hearts. Along with their facebook page, they also own a web where they post all kinds of fashion and beauty related articles that will become your guide in the fashion world. You can estimate the potential of this very platform by the fact that just after a couple of years of its launch, Fashion Everyday managed to earn the Best Women Engaging Content Award in the year 2018. They are also heading towards starting their own online store with all the latest trendy outfits, accessories, and many more. The place where all your fashion wonderings will end. With their unique ideas and ability to keep their users engaged, they hold the ability to rule the online world of fashion.